ComfortDelGro Taxi announced an uptick in bookings made through its call centre and phone app for the first five months of 2018. Taxi bookings grew almost 9% YoY for the month of May – the biggest YoY jump since September 2014. The recent growth in bookings was attributed to the exit of Uber and ComfortDelGro promotions given to passengers. The 4M-YTD bookings growth was not disclosed. Purchase of new taxis and bookings growth are signalling the worst is over. The 200 taxis purchased was the first capex in 1.5 years for new taxis. The 700 taxis (200 already purchased and 500 from tender) represents an additional +5.5% growth to the Comfort and CityCab fleet of 12,687 taxis as at end-March. ComfortDelGro’s involvement in the PHV space would be asset-heavy, by owning the cars and leasing them out. 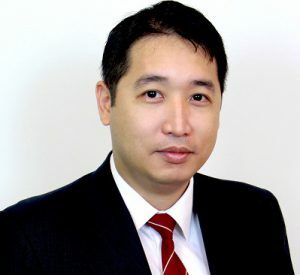 Nonetheless, an asset-heavy model would leverage on the Group’s core competency of fleet management and also bring about larger operational scale for the Automotive Engineering Services business. We think it could be possible for ComfortDelGro to explore buying Uber’s unhired cars that have been put up for sale in the used-car market recently, in anticipation of its rumoured partnership with Go-Jek. The outlook is positive and improving. We discuss in our Land Transport sector report (8 June) the positive industry restructuring (Uber’s exit from the market) and regulatory action coming into effect which levels the playing field (deadline for attaining Private Hire Car Driver’s Vocational Licence). The purchase of new taxis and bookings growth are signalling the worst is over. 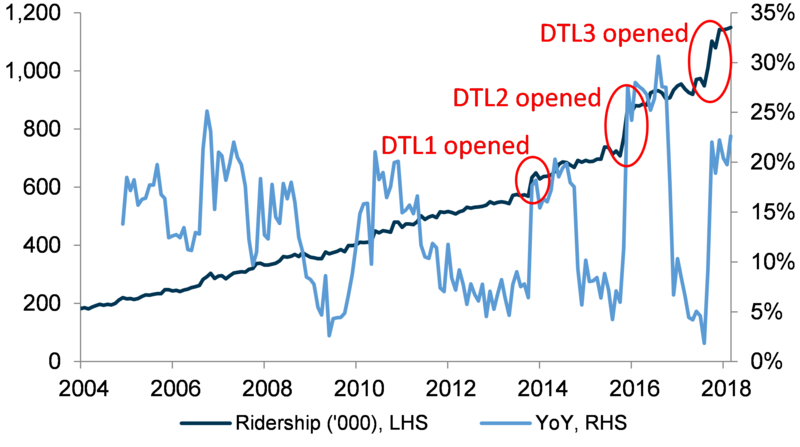 At the same time, we are confident of the narrowing of Downtown Line (DTL) losses, as ridership ramps up (discussed overleaf). This should positively mitigate the impact from the transition of North East Line (NEL) and Sengkang LRT and Punggol LRT (SPLRT) to the new rail financing framework (NRFF), which has an EBIT margin cap of 5%. We have tweaked our assumptions for Taxi revenue and capex, as well as Rail ridership. Our FY18e/FY19e PATMI is now +2.3%/+5.3% from previous estimates. Our target price gives an implied FY18e forward P/E multiple of 18.9 times. The 10.4 cents full year dividend is sustainable, supported by positive free cash flow. Noticeable spikes in ridership were due to the commencement of service for DTL1, DTL2 and DTL3 in December 2013, December 2015 and October 2017 respectively.